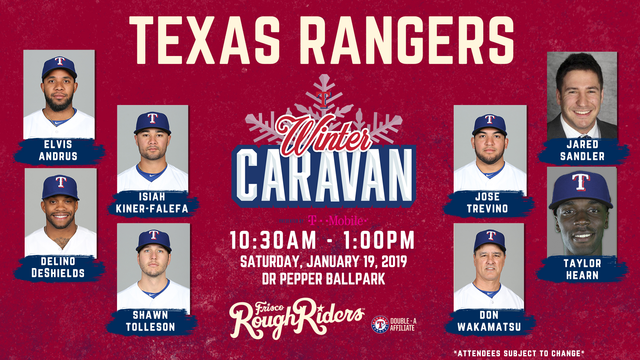 FRISCO, Texas (Jan. 7, 2019) - The Frisco RoughRiders are welcoming the Texas Rangers Winter Caravan to Dr Pepper Ballpark Saturday, January 19 from 10:30 a.m.-1:00 p.m. Scheduled guests include Elvis Andrus, Delino DeShields, Taylor Hearn, Isiah Kiner-Falefa, Shawn Tolleson, Jose Trevino, Don Wakamatsu and Jared Sandler. The guests will take part in the always-popular VIP autograph session from 10:30-11:45. For just $75, fans get exclusive access to an autograph session and a chance to meet all players in attendance. Proceeds benefit the RoughRiders Foundation. Space is extremely limited and the event has sold out quickly the last few years, so get your tickets when they go on sale Tuesday, January 8 at 9:00 a.m. by clicking here. Rangers guests will also participate in a public autograph session from 12:00-1:00 p.m. Fans will receive vouchers for an autograph line as they enter the gates. The 2019 RoughRiders season begins April 4 at Dr Pepper Ballpark. Ticket memberships and group hospitality packages are now on sale. The promotional calendar will be unveiled soon with single-game tickets going on sale around the same time. For more information, visit RidersBaseball.com or call (972) 731-9200.